The Orchestre Philharmonique de Monte Carlo, conducted by Pascal Rophe, with Liza Kerob on violin, and Marc Coppey on cello. In collaboration with the Ballets de Monte Carlo. 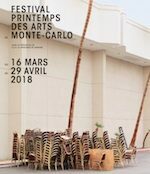 For a listing of all Printemps des Arts 2018 events, visit our page: Printemps des Arts 2018 and for more information about the event visit the webiste: Festival Printemps des Arts de Monte Carlo.